30×30 Bonus Day! 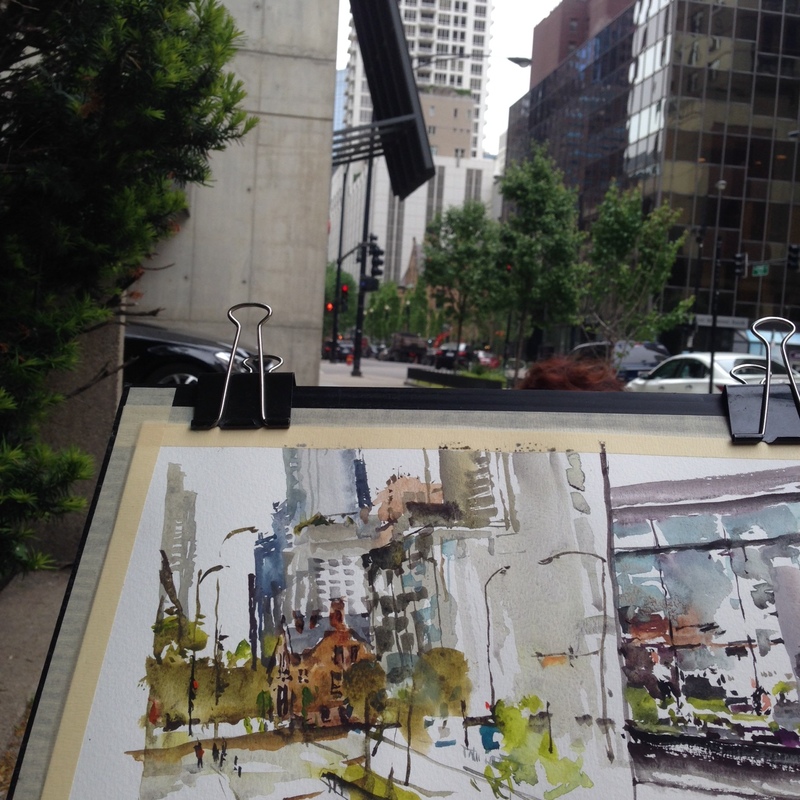 Back from USK Chicago! Here’s me with my eyes closed behind Mike D snapping the selflie with Uma and Jingo. Just four of the many great instructors at this years USK Chicago Seminar. 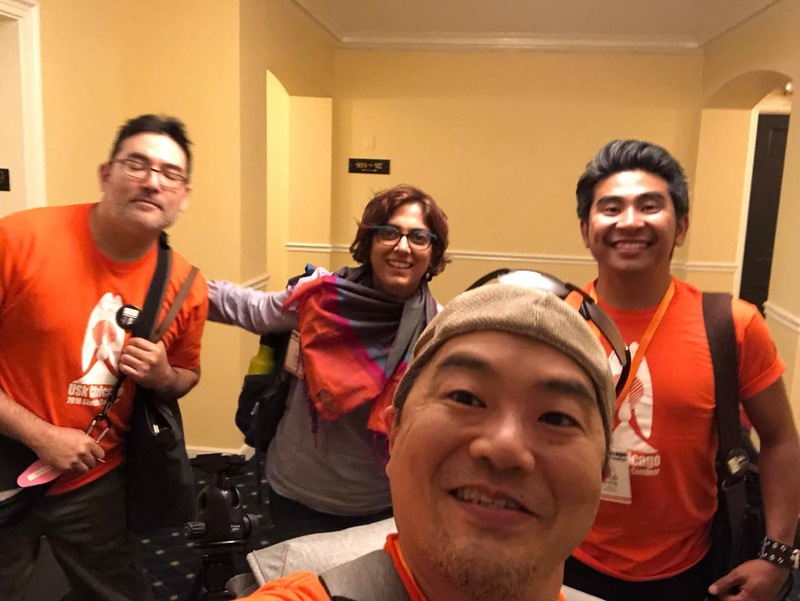 Look for Team Orange at USKPorto2018 next month! The first morning of the workshop, Uma and I had a chance for a warmup. 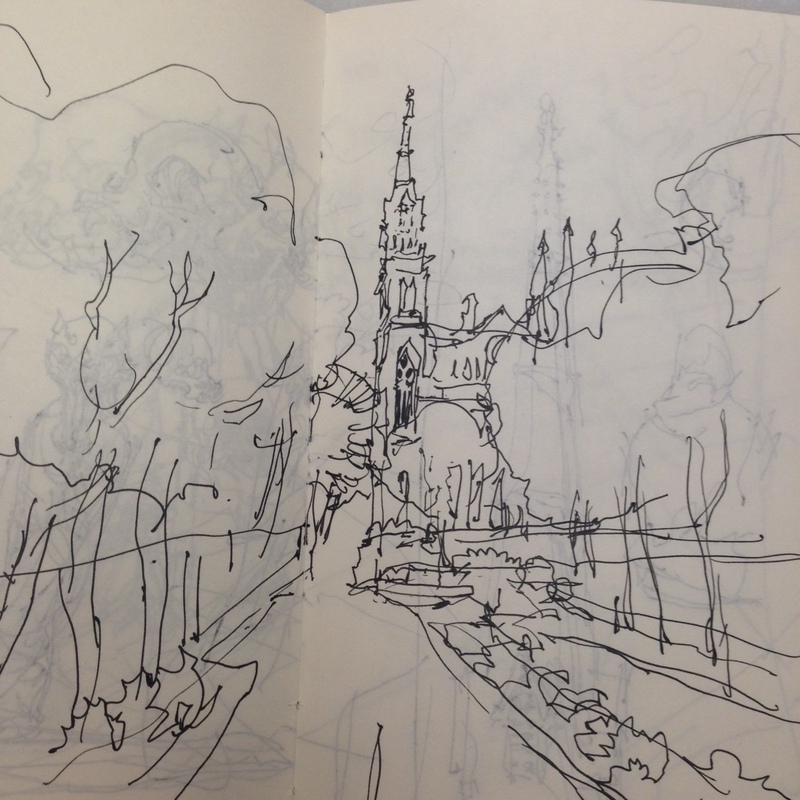 I sketched a brownstone hidden behind some trees, and a very random choice – a second-story window. You could just see the hair salon through all the reflection. This little Art-Toolkit.com palette really is the best thing for clipping to your painting. It’s so light, It makes holding the book/board so easy. I did a quick run around my demo spot, to pick the view. At a workshop, a spot where you can fit 15 students is not the same as where you might stand on your own. This 5-minute doodle was just a test. I did a few views this way to find something that might work. It’s always a little traumatic – trying to paint and lecture at the same time. Day Two, having had a practice run, it’s always a better piece. 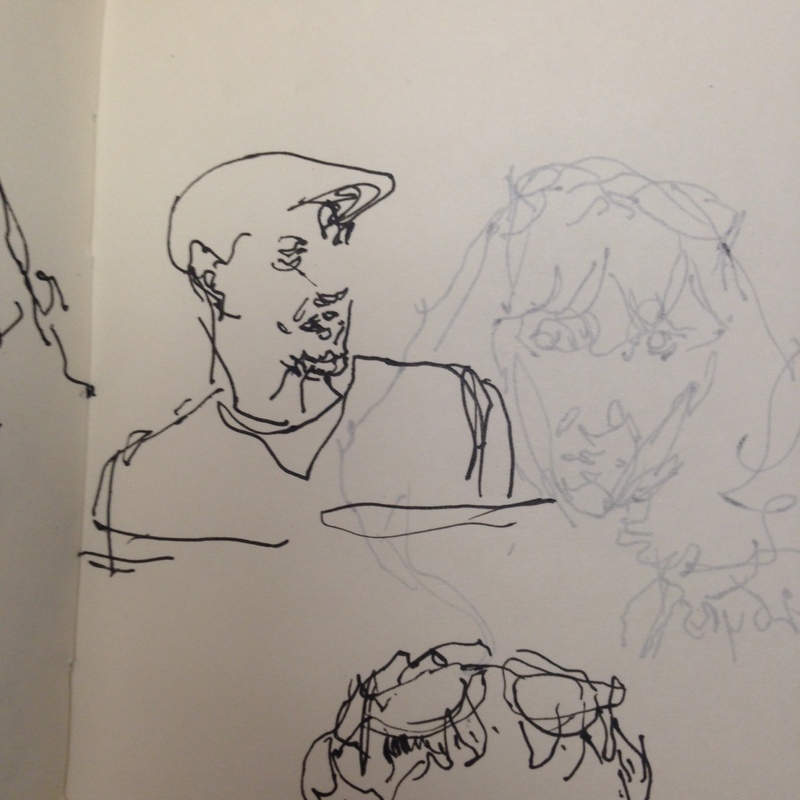 The only demo I had a chance to attend myself was Mike D’s, Sketch NOW, Think Later! Mike is an experienced presenter. 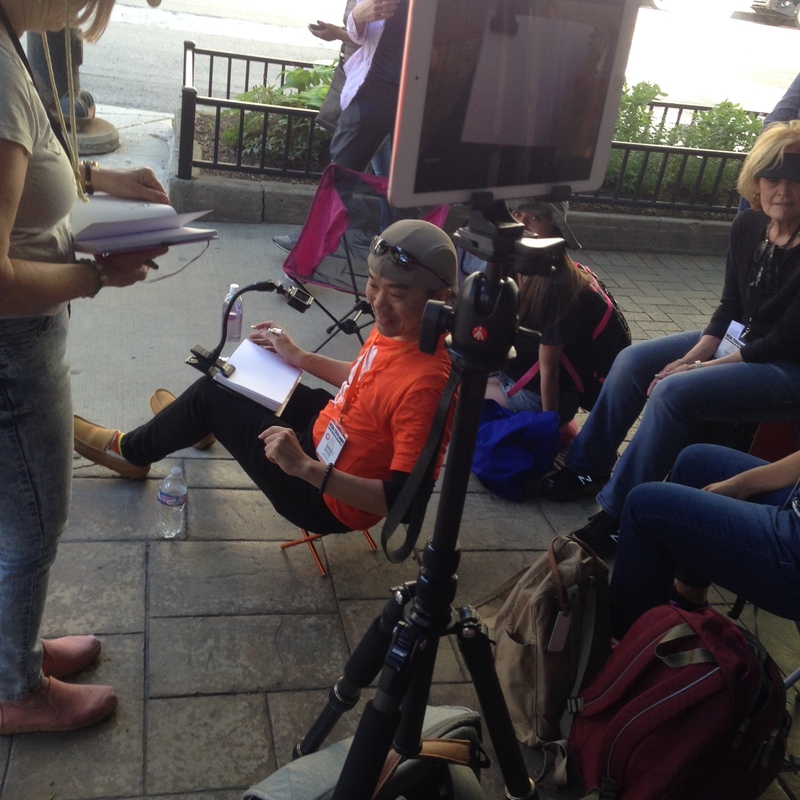 He brought a wireless camera and an iPad, to project his sketchpad to the people in the back row. Brilliant! 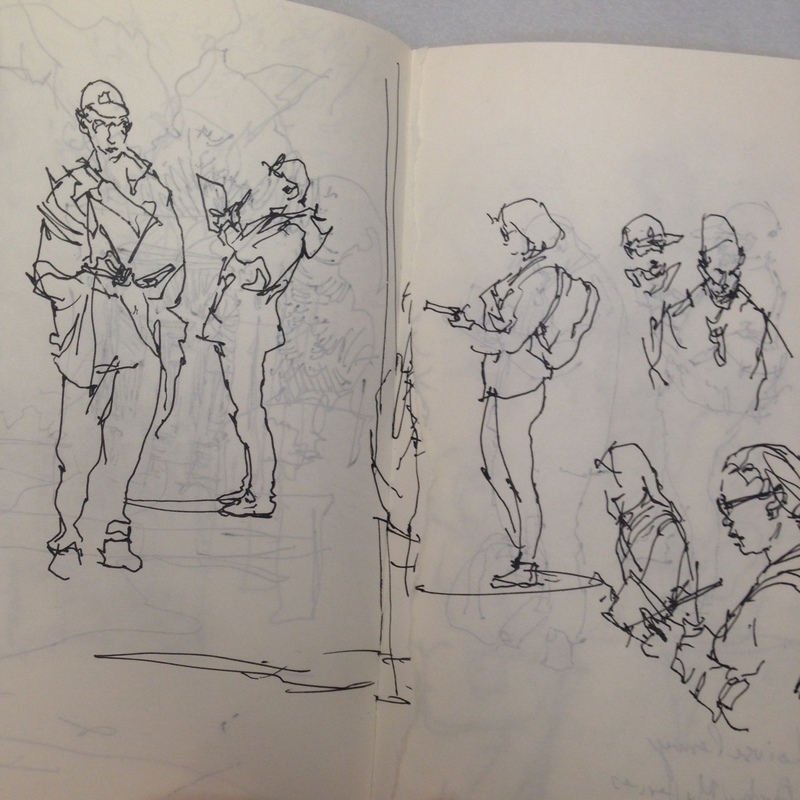 One of the best things about a USK workshop is that you can sketch all the other Sketchers, without worry you’ll be caught drawing someone. 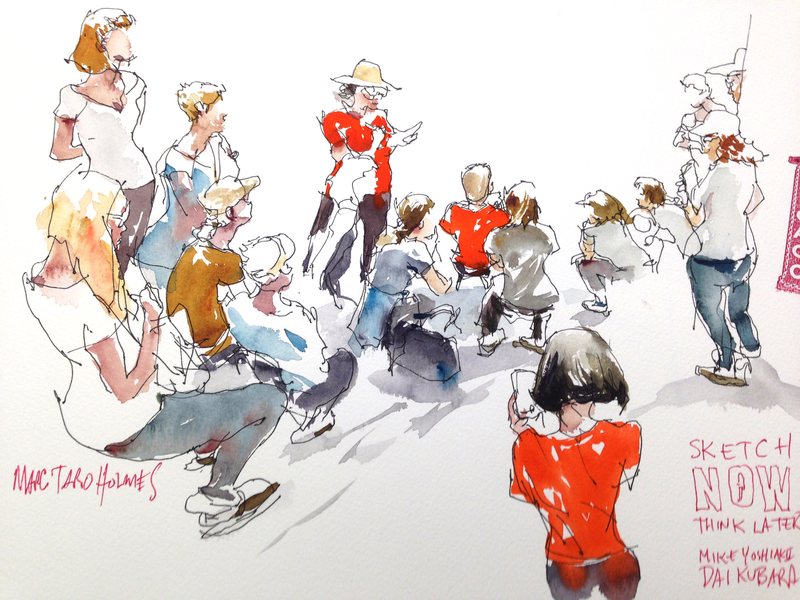 Wes Douglas – has a great workshop on drawing cars. I regret missing that one! 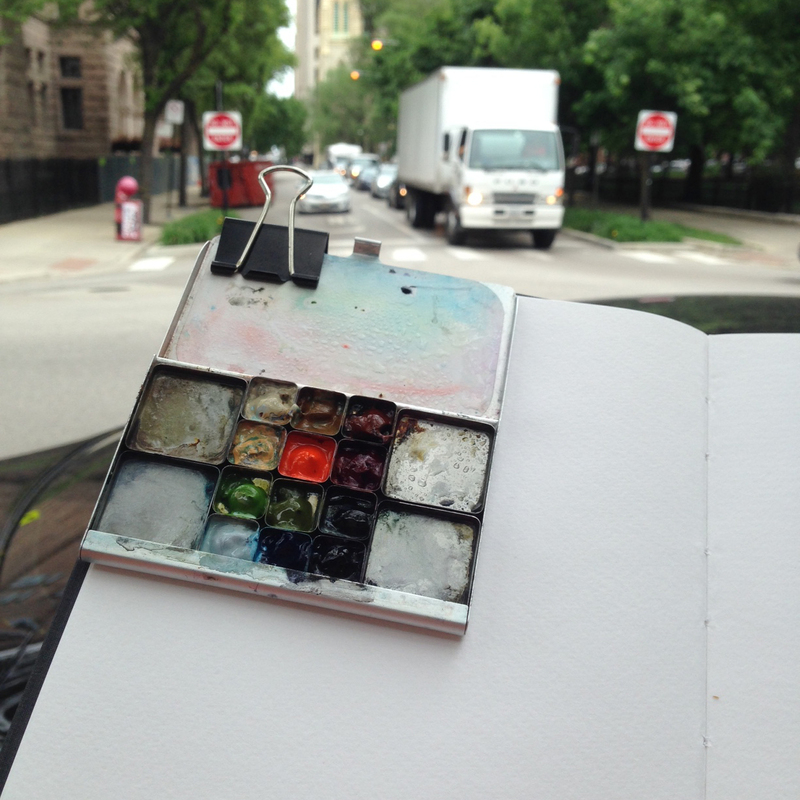 Cars are such a part of street sketching. As I’m from Montreal – someone recommended the writer Lousie Penny. Mysteries set in Quebec. These kind of notes get written right into the sketchbooks. Fantastic post! 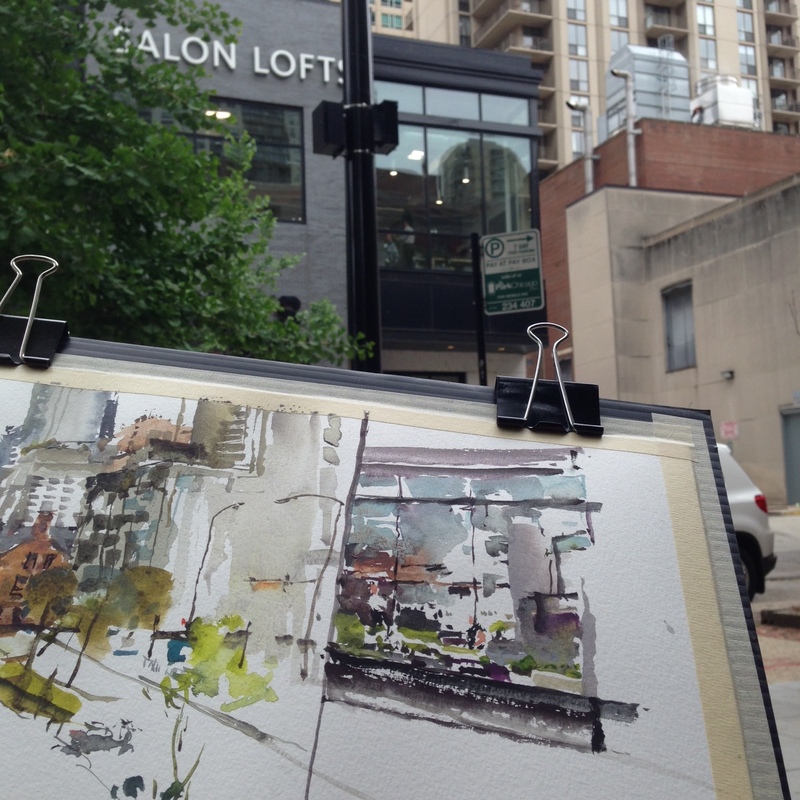 Fascinating drawings and watercolor sketches. They are luscious Marc. Thank you for sharing. 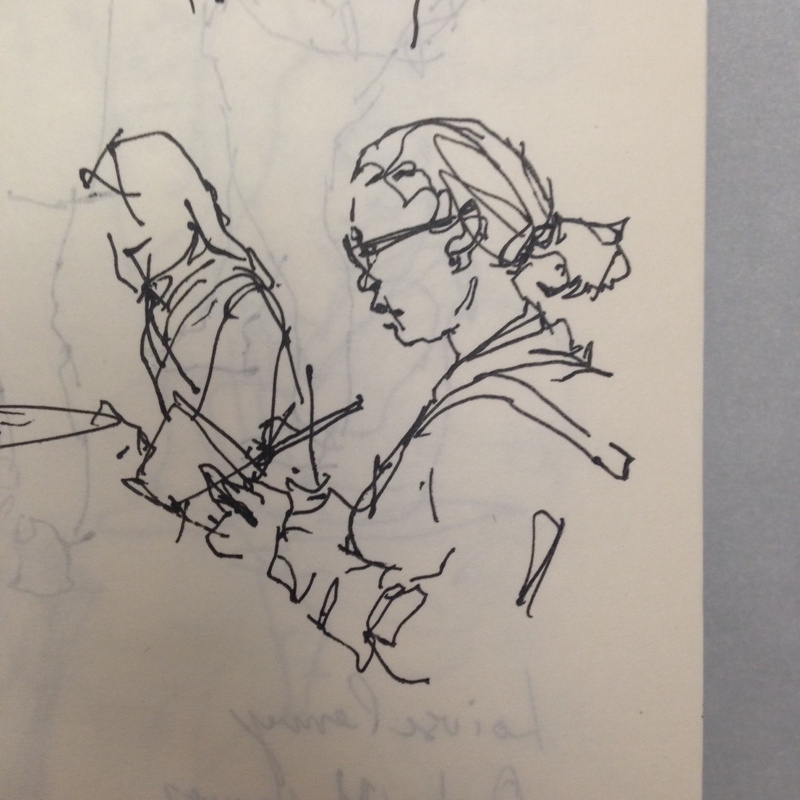 I recognized myself in your sketch at Mike Daikubara workshop! I am the one in orange t-shirt recording and taking photos. I am still trying to digest all I learned in the great workshops I took with Barbara Weeks, Adriana Gasparich, Don Colley and Wes Douglas. Was not able to get yours. But thank you for signing my 100 people in one week challenge sketchbook. I walked 9.8 miles in 2.5 days and lost 14 pounds during it. But had fantastic time with a great group of people. Looking forward to next years seminar. Sounds like you had a great time Bob! I actually think everyone had a great time Marc. Glad I took Wes’s workshop. 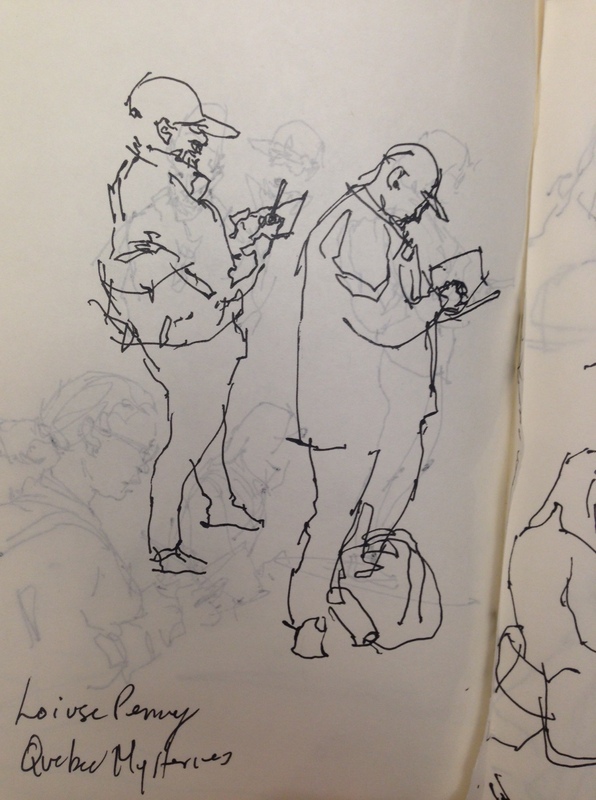 That will help with work free airport sketch’s I post on Usk Chicago of ground equipment, plane stuff from different angles than what passengers see. What kind of wireless digital camera does Mike D use in the photo. I teach natural science drawing and this would be a great asset to any video that I may want to use. Thank you very much indeed! 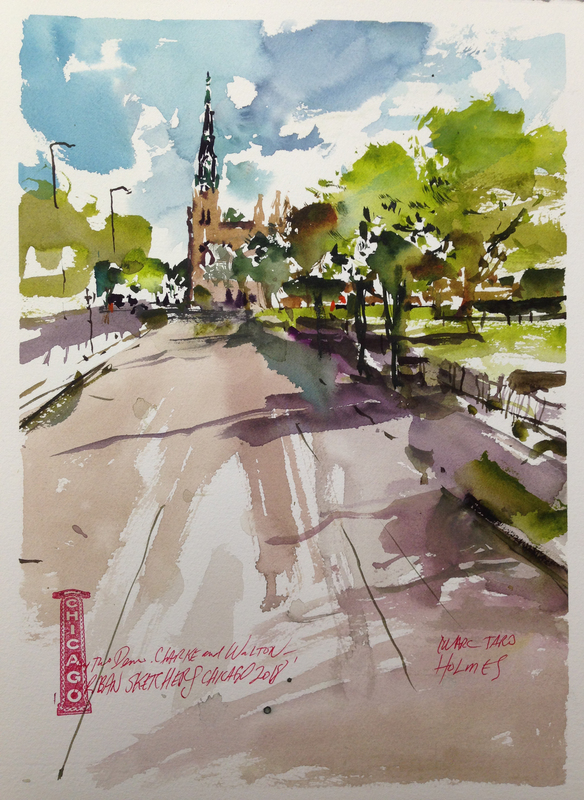 I bought an art toolkit (great product) and hope I can get out there &catch up to you all. Want to share via Instagram, have to finish setting up the account & get some guidance on uploading, size of images , etc. It was a GoPro but I don’t know the exact model. They probably don’t all have the wireless. Your high end camera shops will know. I bought a wee paint kit as you advertised, for travel. I now have it with me on a trip to Ontario and can’t wait to use it! One thing that I have to suggest is that the shipper from Seattle should not only label it as watercolour kit but also indicate that it is a sample I.e. not for resale. I was charged an extra $17 as a fee by customs! Louise Penny writes good mysteries based in the Eastern townships of Quebec and featuring a heroic French Canadian Chief Inspector! I love the spontaneity of your sketches. I too enjoy the series by Louise Penny–on book 12 at present. Your painting is super–says so much without a lot of detail. And I love the painting of the group. Just a bit of color with that bright red leading the eye. Thanks. That would be a great drawing spot. Is it every wed?